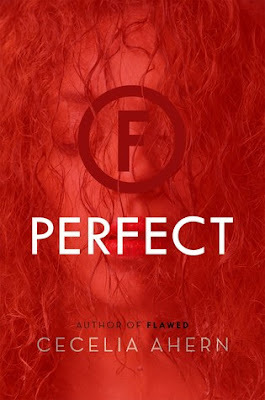 Perfect is the second installment in author Cecelia Ahern's Flawed duology. 18-year old Celestine North lives in a country called Humming where everything from lying, to stealing, to making a bad judgment, to disloyalty, to speaking out against something wrong, is subjugated to a morality court penalty. Celestine has gone from the Perfect student, to a girl who made the choice to stand up for something so simplistic, that she should have been lauded, instead of terrorized. Having made the choice to help a Flawed older man while others stood by and did nothing, Celestine found herself being branded as Flawed by Judge Bosco Crevan, also the head of the Guild. At the end of Flawed, Celestine's chose to run, rather than face continued harassment by Judge Crevan, or deal with daily visits by Whistleblowers, most especially Mary May, who watches her every movement. But, things are far from over for Celestine, and for those who know about her secret. Facing constant worry about being caught by Whistleblowers eager to bring her back to face further judgment, Celestine reunites with Carrick, one of the few people in the world to know about Celestine's secret that, if exposed, could bring the entire Guild, as well as Judge Crevan down to their knees. Carrick isn't the only one that knows about Celestine's secret. The fact that every single person who was there that day, or found out about it in other ways, have all suddenly disappeared without a trace. Celestine knows that Judge Crevan is growing increasingly desperate by the day to bring her in, especially since she embarrassed him by not doing exactly what he told her to do. Becoming the most wanted person in the country for having the backbone to stand up to a psychopathic monster was the first step in accepting that she can be both Perfect, and Flawed at the same time. She doesn't need anyone, including the Guild, or Whistleblowers to tell her how she should be living her life. But, the most intriguing part of this story is Celestine's growth as a human being. She is a Flawed person who made a choice like you or I will do on a daily basis. She made the choice to stand her ground, even though it cost her everything, including her ex-boyfriend Art. She makes some wonderful friend along the way in this story who stand by her when things look the darkest. This includes her sister, and her mother who put their own lives on the line in order to help Celestine when she needs them the most. As a character, Celestine was thought of being a very intelligent person. I didn't see that come through in the first book. But, her determination and her intelligence really do stand out in this story. She makes plans in case other plans don't plan out. She doesn't truly trust anyone, but makes plans with people who may hold her future in their hands. She brings together those who have similar goals, and makes one helluva stand. I do have to mention Art since there is not way you can get through this story without Art. I mistakenly believed that Art was a jerk of epic proportions in Flawed. But, by the time this story was over, I found myself respecting him a whole lot.